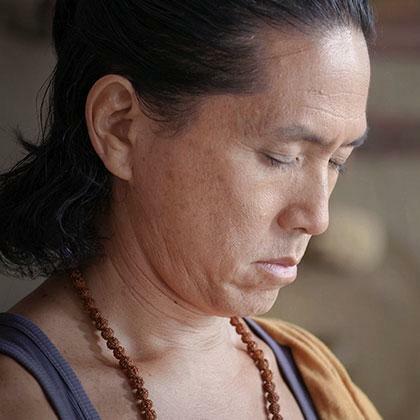 Govinda Kai has studied and dedicated himself to martial arts, meditative disciplines and yoga for over 20 years. He is one of the select individuals in the world who are certified to teach the Ashtanga Yoga Method by its founder, Sri K. Pattabhi Jois. His quest for truth and purity in the more essential parts of his self and life has taken him all over the world. He spent two years studying Tibetan Buddhism under the tutelage of Sogyal Rinpoche and also studied Aikido with some of the foremost instructors in the world. A group talk on spiritual aspiration and hunger given during the Spiritual Revolution Retreat in Angouleme, France, 2014. In modern society, we are primarily focused externally. Understand the difference and importance between an external and an internal focus in the practice of yoga. Why do we chant? Gain a deeper understanding of this ancient practice. A guided practice of Surya Namaskara A & B, also known as Salutation to the Sun. These are two very foundational sequences of yoga postures suitable for all levels. A guided intermediate practice of Surya Namaskara. This practice is the essence of the Ashtanga Yoga method. You will be guided to focus on the subtle aspects and quality of your intention during your practice. A practice of chanting and meditation designed to connect you to a place of stillness within. By using simple techniques, this practice assists you in attaining more peaceful states of mind. Govinda Kai has studied and dedicated himself to martial arts, meditative disciplines and yoga for over 20 years. He is one of the select individuals in the world who are certified to teach the Ashtanga Yoga Method by its founder, Sri K. Pattabhi Jois. His quest for truth and purity in the more essential parts of his self and life has taken him all over the world. He spent two years studying Tibetan Buddhism under the tutelage of Sogyal Rinpoche (author of “The Tibetan Book of Living and Dying”) and also studied Aikido with some of the foremost instructors in the world. With over 15 years of experience teaching yoga in various locations across Asia, America, and Europe, Govinda brings a deep sense of wisdom to his work–a passion for the spiritual life and deep transformation emerge in all of his lectures, classes, and workshops. He brings depth, a cross cultural perspective, and many years of self study and discipline to his global and diverse body of students.